Matthew George Whitaker (born October 29, 1969) is an American lawyer and politician who served as the Acting United States Attorney General from November 7, 2018, to February 14, 2019. He was appointed to that position by President Donald Trump after Jeff Sessions resigned at Trump's request. Whitaker had previously served as Chief of Staff to Sessions from September 2017 to November 2018. On December 7, 2018, Trump announced his nomination of William Barr for Attorney General, leaving Whitaker's future at the Department of Justice in doubt. On February 15, 2019, after Barr was sworn in on the previous day, Whitaker became a senior counselor in the Office of the Associate Attorney General, serving in that position until his resignation on March 2, 2019. For other people named Matthew Whitaker, see Matthew Whitaker (disambiguation). 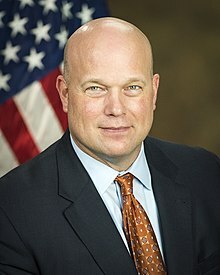 Matthew George Whitaker (born October 29, 1969) is an American lawyer and politician who served as the Acting United States Attorney General from November 7, 2018, to February 14, 2019. He was appointed to that position by President Donald Trump after Jeff Sessions resigned at Trump's request. Whitaker had previously served as Chief of Staff to Sessions from September 2017 to November 2018. On December 7, 2018, Trump announced his nomination of William Barr for Attorney General, leaving Whitaker's future at the Department of Justice in doubt. On February 15, 2019, after Barr was sworn in on the previous day, Whitaker became a senior counselor in the Office of the Associate Attorney General, serving in that position until his resignation on March 2, 2019. In 2002, Whitaker was the candidate of the Republican Party for Treasurer of Iowa. From 2004 to 2009, he served as the United States Attorney for the Southern District of Iowa. Whitaker ran in the 2014 Iowa Republican primary for the United States Senate. He later wrote opinion pieces and appeared on talk-radio shows and cable news as the director of the Foundation for Accountability and Civic Trust (FACT), a conservative advocacy group. He was also involved with World Patent Marketing, which was fined $26 million and shut down by the Federal Trade Commission in 2017 for deceiving consumers. The legality of Whitaker's appointment as Acting U.S. Attorney General was challenged in multiple lawsuits. Legal scholars, commentators, and politicians have questioned the legality and constitutionality of his appointment, arguing that his selection circumvented Senate confirmation. Some also called for Whitaker to recuse himself from overseeing the Special Counsel investigation because of potential conflicts of interest. In January 2019, the Supreme Court denied a petition challenging the appointment. Matthew George Whitaker was born in Des Moines, Iowa, on October 29, 1969. His mother was a schoolteacher and his father a car salesman. Whitaker graduated from Ankeny High School and attended the University of Iowa, from which he graduated with a bachelor's degree in communications, a Master of Business Administration, and a J.D. degree in 1995. After graduating from law school, Whitaker worked for a number of regional law firms including Briggs & Morgan (Minneapolis) and Finley Alt Smith (Des Moines). He was also corporate counsel for a national grocery company, SuperValu, and small businessman owning interests in a trailer manufacturing company, a daycare, and a concrete supply company. Whitaker ran as a Republican for Treasurer of Iowa in 2002, losing to incumbent Democrat Michael Fitzgerald by 55% to 43%. In 2003, Whitaker founded Buy the Yard Concrete, based in Urbandale, Iowa, which did projects as far away as Las Vegas. In 2005, Whitaker was named as a defendant to a collections lawsuit in Nevada for $12,000 in unpaid invoices for supplies and equipment rentals related to a concrete project in Las Vegas. The lawsuit was settled out of court. On June 15, 2004, Whitaker was appointed U.S. Attorney for the Southern District of Iowa by President George W. Bush. The appointment was at the recommendation of Iowa Senator Chuck Grassley, in spite of Whitaker's minimal relevant legal experience. From 2005 to 2007, Whitaker was responsible for the unsuccessful investigation and prosecution of Iowa State Sen. Matt McCoy on charges of attempting to extort $2,000. A columnist for the Des Moines Register said that the case "... was based on the word of a man former associates depicted as a drug user, a deadbeat and an abuser of women; a man so shady even his Alcoholics Anonymous sponsors called him 'a pathological liar.'" The jury took less than two hours to return a verdict of "not guilty". As U.S. Attorney, Whitaker sought unusually stringent sentences for individuals accused of drug crimes. One of the cases involved a non-violent drug offender who was given the option by Whitaker's office of being prosecuted with the chance of spending the rest of her life in jail or accept a plea deal of 21 to 27 years in prison. Federal Judge Robert W. Pratt later said the prosecutors in the case had "misused" their authority and urged President Obama (who had then become president) to grant the non-violent drug offender clemency; President Obama commuted her sentence, after she had served 11 years in prison. Whitaker resigned in November 2009 following the Senate confirmation of his replacement, Nicholas A. Klinefeldt, who was nominated by President Obama. From 2009 to 2017, Whitaker was a managing partner of the small general practice law firm Whitaker Hagenow & Gustoff LLP (now Hagenow & Gustoff LLP) in Des Moines, Iowa. In 2011 Whitaker co-founded Whitaker Strategy Group, an Iowan lobbying and consulting firm that promoted business and job growth in Iowa. During the 2012 presidential campaign, Whitaker was Minnesota governor Tim Pawlenty's co-chairman in Iowa, and then state co-chairman for Texas governor Rick Perry. Whitaker was a candidate for the Republican nomination in the 2014 United States Senate election in Iowa, a seat being vacated by Democrat Tom Harkin. He came in fourth in the Republican primary, with 11,909 votes (7.54%). The nomination was won by Joni Ernst, who went on to win the general election. After losing the Republican primary, Whitaker chaired the campaign of Sam Clovis, another unsuccessful primary candidate who had been selected to run for Iowa State Treasurer. Clovis lost in the November 2014 general election. In 2012, Whitaker and two partners used their company, MEM Investment, to purchase and develop an affordable-housing apartment building in Des Moines. In 2014, the partnership reverted to just Whitaker. By spring of 2016, the company failed to deliver on the contracted renovation, the city terminated the loan agreement, Lincoln Savings Bank declared MEM in default of the $687,000 mortgage, and the property was sold to another developer for completion. In 2014, Whitaker joined the board of World Patent Marketing (WPM) which was a fraudulent invention promotion firm based in Florida that deceived inventors into thinking that the company had successfully commercialized other inventions. The company contributed to Whitaker's 2014 US Senate campaign, and Whitaker performed almost $17,000 in compensable work for the company between 2014 and 2017. In March 2017, the Federal Trade Commission charged the company with fraudulently deceiving consumers and suppressing complaints through intimidation and the use of gag clauses. In May 2018, a federal court ordered the company to close and pay a $26 million fine. Many customers suffered significant losses as a result of working with the company, and when they tried to recoup their fees, the company used Whitaker's background as a U.S. Attorney to threaten them. In a 2015 email mentioning his background as a former federal prosecutor, Whitaker told a customer that filing a complaint with the Better Business Bureau or "smearing" the company online could result in "serious civil and criminal consequences." The owner of Ripoff Report told The Wall Street Journal that Whitaker had called him in 2015 demanding his website take down negative reports about WPM, alleging, "He threatened to ruin my business if I didn’t remove the reports. He [said he] would have the government shut me down under some homeland security law." In 2017, FTC investigators examined whether Whitaker had played any role in making threats of legal action to silence the company's critics. Whitaker rebuffed an FTC subpoena for records in October 2017, shortly after he had joined the Department of Justice. After Whitaker's appointment in the Department of Justice in September 2017, White House and senior Justice Department officials were surprised to learn of Whitaker's connection to the company. Through a DOJ spokesperson, Whitaker has denied awareness of the company's fraud. The court receiver in the case said he has “no reason to believe that [Whitaker] knew of any of the wrongdoing.” As of November 2018, the FBI was still investigating World Patent Marketing. From October 2014 to September 2017, Whitaker was the executive director of the Foundation for Accountability and Civic Trust (FACT); he was the organization's only full-time employee in 2015 and 2016. FACT, founded in late 2014, is a conservative nonprofit organization specializing in legal and ethical issues related to politics. The group was backed by $1 million in seed money from conservative donors, whom Whitaker declined to identify to the media. According to the organization's first tax return, its funding — $600,000 in 2014 — came from a conservative donor-advised fund called DonorsTrust, a pass-through vehicle that allows donors to remain anonymous. From its creation in 2014 through 2018, FACT reported contributions of $3.5 million on its tax filings; as a 501(c)(3) "dark money" group, it did not disclose its donors. The group's largest single expense was Whitaker's salary; Whitaker collected $1.2 million from the group over four years, making it the overwhelming source of his income from 2016 onward. While Whitaker was the head of FACT, the organization had a special focus on the Hillary Clinton email controversy and perceived favoritism in the business dealings of Clinton. Despite claiming to be nonpartisan, the organization called for ethics investigations into or filed complaints for more than 40 different Democratic politicians, officials, and organizations, compared to only a few Republicans. FACT has been described as using "the legal system as a political weapon", and was characterized by a GOP operative as a "chop shop of fake ethics complaints". During his time at FACT, Whitaker wrote opinion pieces that appeared in USA Today and the Washington Examiner, and he appeared regularly on conservative talk-radio shows and cable news. For four months, from June to September 2017, Whitaker was a CNN contributor. One month prior to joining the Justice Department, he wrote an opinion column for CNN titled "Mueller's Investigation of Trump is Going Too Far." He retweeted an article that stated that Mueller's investigation was a "lynch mob", that it should be limited, and that it should not probe into Trump's finances. On September 22, 2017, a Justice Department official announced that Sessions had appointed Whitaker to replace Jody Hunt as his chief of staff. George J. Terwilliger III, a former U.S. attorney and deputy attorney general, said in his role as chief of staff, Whitaker would have dealt daily with making "substantive choices about what is important to bring to the AG...."
With the resignation of Sessions on November 7, 2018, Whitaker was appointed to serve as Acting Attorney General under the Federal Vacancies Reform Act of 1998. In that position, he directly supervised Robert Mueller's Special Counsel investigation, which had previously been supervised by Deputy Attorney General Rod Rosenstein in his role as Acting Attorney General, due to the recusal of Attorney General Jeff Sessions. U.S. Department of Justice, Department of Homeland Security, Department of Commerce and Federal Bureau of Investigation announces 23 criminal charges against PRC's Huawei and Wanzhou Meng. In January 2019, Whitaker along with U.S. Homeland Security Secretary Kirstjen Nielsen, Commerce Secretary Wilbur Ross, and FBI Director Christopher A. Wray, announced 23 criminal charges (including financial fraud, money laundering, conspiracy to defraud the United States, theft of trade secret technology, provided bonus to workers who stole confidential information from companies around the world, wire fraud, obstruction of justice and sanctions violations) against Chinese tech giant Huawei and its CFO Wanzhou Meng. Assistant attorney general and spokesperson Stephen Boyd explained in a letter to the leaders of the Senate that, though a recommendation of Justice Department ethics officials was that Whitaker recuse himself from oversight of the Special Counsel, Whitaker would not recuse himself because he did not want to set a precedent for close cases. Democrats poised to assume chairmanships of key House committees in January 2019 warned the Justice Department and other departments to preserve records relating to the Mueller investigation and Sessions' firing. Republicans Senator Susan Collins, Senator Jeff Flake, and Senator-elect Mitt Romney, also issued statements insisting that Mueller's investigation must remain free from interference. A number of prominent legal experts, scholars, and former prosecutors and Department of Justice officials raised concerns over the legality and constitutionality of Whitaker's appointment. Lawyers Neal Katyal and George T. Conway III argued in a New York Times op-ed that the appointment was unconstitutional under the Appointments Clause, as the position of Attorney General is a "principal" one requiring Senate confirmation. In defense of the legality of the appointment, University of Texas law professor Stephen Vladeck argued that the Federal Vacancies Reform Act of 1998 and the U.S. Supreme Court decision United States v. Eaton allowed the appointment, because it was temporary and that Sessions formally resigned. Law professor John Yoo from Berkeley, who served as a deputy assistant attorney general in the Office of Legal Counsel in the George W. Bush administration, argued that the Appointments Clause renders the Federal Vacancies Reform Act unconstitutional and that Whitaker's appointment was in violation of that clause. John E. Bies, who served as a deputy assistant attorney general in the Office of Legal Counsel in the Obama Administration, wrote that the legality and constitutionality of Whitaker's appointment was an open question. Bies also pointed out that it was a difficult argument to make that Sessions was fired instead of resigning since a court would probably not "look past an official’s formal statement that they resigned". The U.S. Department of Justice's Office of Legal Counsel concluded that the appointment was constitutional due to its temporary nature. The OLC noted that an assistant attorney general who was not confirmed by the Senate had been appointed as acting Attorney General in 1866, and that other individuals not confirmed by the Senate had served as principal officers in an acting capacity more than 160 times between 1809 and 1860, and at least nine times during the Trump, Obama, and Bush administrations. There were at least nine legal challenges to Whitaker's appointment. Maryland Attorney General Brian Frosh, representing the State of Maryland, filed for an injunction against Whitaker's appointment. Maryland had previously filed a suit against then-Attorney General Jeff Sessions regarding his inability to defend the Affordable Care Act in court as part of a broader hostility against the Obama-era law from the Trump administration. Maryland was expected to test the argument in court that Whitaker was unlawfully named acting Attorney General, and thus had no standing in the court or authority to respond to their lawsuit. Maryland argued that Whitaker's appointment violated the Constitution, which requires that principal officers of the United States be appointed "with the Advice and Consent of the Senate." Because Whitaker was not serving in a Senate-confirmed position when he was appointed, the state argued that the role of acting Attorney General rightfully belonged to Deputy Attorney General Rod J. Rosenstein. A judge set a hearing for December 19, 2018. Three Democratic senators—Richard Blumenthal, Sheldon Whitehouse, and Mazie Hirono—filed suit on November 18, 2018, in the DC Circuit Court, saying the President violated the Constitution and denied the Senate its right to approve the nomination. Lawyers for Doug Haning, a former agricultural products executive, filed a motion on November 13, 2018, asking a federal court in St. Louis to rule that Whitaker’s appointment as acting Attorney General was illegal and thus he had no standing to hear the case South Texas College of Law professor Josh Blackman predicted a flood of similar motions. Attorney Tom Goldstein filed a motion with the Supreme Court on November 16, 2018 on behalf of a Nevada resident, asking the court to decide whether Rod Rosenstein was the statutory and constitutional successor to Sessions in a pending lawsuit, rather than Whitaker. The Supreme Court denied the motion on January 14, 2019. Whitaker stated in a question-and-answer session during his 2014 Iowa Senatorial campaign that "the courts are supposed to be the inferior branch." Whitaker was critical of the United States Supreme Court's decision in Marbury v. Madison (1803), the decision that allows judicial review of the constitutionality of the acts of the other branches of government, and several other Supreme Court holdings. Harvard Law professor Laurence Tribe commented on Whitaker's views that "the overall picture he presents would have virtually no scholarly support," and that they would be "'destabilizing' to society if he used the power of the attorney general to advance them." Whitaker also stated during his 2014 Senate bid that he would not support "secular" judges and that judges should "have a biblical view of justice." Asked if he meant Levitical or New Testament justice, he replied "I’m a New Testament." Whitaker's answer has been interpreted by various individuals and groups, including the Anti-Defamation League, to imply that he would disqualify non-Christian judges, and were condemned as unconstitutional. An ADL spokesperson said, “The notion that non-Christian judges are disqualified from service is patently wrong, and completely inconsistent with the U.S. Constitution, which explicitly bars any religious test for public office." Whitaker stated in 2013 he supports the right of states to nullify federal laws. Stephen Vladeck, a University of Texas law professor, stated that Whitaker's views on nullification are "irreconcilable not only with the structure of the Constitution, but with its text, especially the text of the Supremacy Clause," and added that "For someone who holds those views to be the nation's chief law enforcement officer, even temporarily, is more than a little terrifying." During the months prior to joining the Justice Department as Jeff Sessions' chief of staff in September 2017, Whitaker made several statements critical of the Mueller investigation, of which he assumed oversight responsibility upon being appointed Acting Attorney General in November 2018. By July 2017, the Trump White House was interviewing Whitaker to join the Trump legal team. During a six-month span in 2017, Whitaker insisted that there was no obstruction of justice or collusion and criticized the initial appointment of the special counsel. He also called the probe "political" and "the left is trying to sow this theory that essentially Russians interfered with the U.S. election, which has been proven false.” He also published an op-ed titled, "Mueller's Investigation of Trump Is Going Too Far" in which he expressed skepticism about the investigation generally and called the appointment of Mueller "ridiculous." Through social media, he also promoted an article that referred to the investigation as a "lynch mob." Trump saw Whitaker's supportive commentaries on CNN in the summer of 2017, and in July White House counsel Don McGahn interviewed Whitaker to join Trump's legal team as an "attack dog" against Robert Mueller, who was heading the Special Counsel investigation. Trump associates believe Whitaker was later hired to limit the fallout of the investigation, including by reining in any Mueller report and preventing Trump from being subpoenaed. On November 13, a DOJ spokesperson said that Whitaker would seek advice from ethics officials at the Department of Justice (DOJ) about whether a recusal from overseeing the Russia investigation was warranted. In 2017 Whitaker provided private advice to Trump on how the White House might pressure the Justice Department to investigate the president's adversaries, including appointing a special counsel to investigate the FBI and Hillary Clinton. Leonard Leo of the Federalist Society recommended Whitaker to McGahn as chief of staff for Sessions, and Whitaker was installed into that role at the direction of the White House. Sessions, it is reported, did not realize for a year that Whitaker wanted to replace him. By early September 2018, Whitaker was on the short list of President Trump's White House staff as the replacement for Don McGahn as the White House Counsel. In September 2018, White House Chief of Staff John Kelly referred to Whitaker as the White House's "eyes and ears" in the Justice Department, which the president considered himself at war with. Trump had spoken with Whitaker in September 2018 about potentially assuming Sessions's role as Attorney General, although it was not clear whether Whitaker would take over on an interim basis or be nominated in a more permanent capacity. At that time, The New York Times described Whitaker as a Trump loyalist who had frequently visited the Oval Office and as having "an easy chemistry" with Trump. Whitaker was referenced by White House staff after a New York Times article disclosed in September that Rod Rosenstein had discussed secretly taping his conversations with the president and talked about using the Twenty-fifth Amendment to remove Trump from office. Trump repeatedly stated on November 9, "I don't know Matt Whitaker," contradicting remarks a month prior on Fox & Friends when he said, "I can tell you Matt Whitaker’s a great guy. I mean, I know Matt Whitaker." The president met with Whitaker at least ten times and frequently talked to him on the phone, and according to a former and a current administration official, Whitaker advised Trump in private on how to potentially pressure the Justice Department into investigating Trump's adversaries. Whitaker's website previously stated that he was a "Christian who regularly attends church with his family, Matt has built a life on hard work and free enterprise"; and he stated in 2014 that “life begins at conception.” In 2014, he advocated for reducing the influence of the government saying, "I know that the government forcing people to violate their faith must never be tolerated. In the Senate, I will be a steadfast protector of every American's religious rights." Whitaker claimed he was not a "climate change denier" but said that the evidence is "inconclusive” and indicated he did not support regulations on carbon emissions. He has expressed a desire to get rid of family reunification and is against amnesty for illegal immigrants. Whitaker argued in 2014 that expressing homophobic comments was a legitimate expression of religious beliefs that should be considered protected speech, saying, “I just really think this case is a prime example of where religious freedom in our country is under assault and we need to send a strong message.” Whitaker supported repealing the Affordable Care Act in his 2014 Senate campaign. Whitaker has three children with his wife, Marci, a civil engineer. He identifies as a Lutheran. ↑ "Jeff Sessions forced out as attorney general". CBS News. November 7, 2018. Retrieved November 9, 2018. ↑ Samuelsohn, Darren; Oprysko, Caitlyn (November 7, 2018). "Sessions ousted". Politico. Retrieved November 7, 2018. ↑ Petroski, William (December 7, 2018). "Iowa's Matt Whitaker's future in limbo as Trump's picks William Barr for attorney general". Des Moines Register. Retrieved December 8, 2018. ↑ "Ex-acting AG Matthew Whitaker leaves Justice Department". March 3, 2019. Retrieved March 4, 2019. ↑ Wilber, Del Quentin (4 March 2019). "Matthew Whitaker, former acting attorney general, leaves Justice Department". Los Angeles Times. Retrieved 6 March 2019. 1 2 3 Swaine, Jon (November 10, 2018). Trump's acting attorney general involved in firm that scammed veterans out of life savings The Guardian. 1 2 Federal Trade Commission, Press Release (May 10, 2018). "FTC Settlement Will Ban Fraudulent Marketers from Invention Promotion Business". www.FTC.gov. Retrieved May 10, 2018. ↑ "After outcry over appointment, Trump's top law enforcer treading..." Reuters. December 16, 2018. Retrieved December 18, 2018. ↑ The legality of Matthew Whitaker's appointment as Acting Attorney General has been disputed by several constitutional scholars. John E. Bies at the Lawfare blog discusses the question. In the New York Times, constitutional scholars Neal Katyal and George T. Conway III assert it is unconstitutional, as does Mark Joseph Stern in Slate. Axios has a summary of the dispute, including a notable opinion from John Yoo who, despite previously endorsing expansive powers for the Presidency, regards the appointment as unconstitutional. ↑ Viswanatha, Aruna; Gurman, Sadie. "Matthew Whitaker, a Critic of the Mueller Investigation, Now Oversees It". WSJ. Retrieved November 11, 2018. ↑ "Jeff Sessions Is Forced Out as Attorney General as Trump Installs Loyalist". Retrieved November 8, 2018. ↑ "Should Whitaker recuse himself from Mueller's investigation?". Retrieved November 14, 2018. ↑ Williams, Pete (January 15, 2019). "Supreme Court rejects challenge to Matt Whitaker's appointment as acting attorney general". NBC News. Retrieved January 15, 2019. 1 2 "Trump names Iowa native Matt Whitaker acting attorney general after Sessions resigns". The Des Moines Register. Associated Press. November 7, 2018. Retrieved November 7, 2018. 1 2 "United States Attorney Announces Resignation". Archived from the original on February 18, 2010. Retrieved January 8, 2010. ↑ "Acting Attorney General Matthew Whitaker Incorrectly Claims Academic All-American Honors". The Wall Street Journal. 2018. Retrieved February 15, 2019. ↑ "Matthew Whitaker biography". U.S. Attorney's Office, Southern District of Iowa. Archived from the original on November 19, 2004. ↑ "2002 State Treasurer General Election Results - Iowa". Dave Leip's Atlas of U.S. Presidential Elections. April 1, 2007. Retrieved November 7, 2018. ↑ Boburg, Sean (November 14, 2018). "Whitaker's unusual path to Justice Department included owning day-care center, trailer maker and concrete supplier". The Washington Post. Retrieved November 14, 2018. ↑ Kirchgaessner, Stephanie; Swaine, Jon (November 12, 2018). "Trump pick Whitaker rose through ranks as partisan targeting Democrats". The Guardian. Archived from the original on November 12, 2018. Retrieved November 13, 2018. ↑ "I Was the Subject of a Political 'Witch Hunt.' Matt Whitaker Directed It". Politico Magazine. Retrieved November 12, 2018. 1 2 Basu, Rekha (December 21, 2007). "Why did Matthew Whitaker prosecute this openly gay state lawmaker?". Des Moines Register. Retrieved November 13, 2018. ↑ Kranish, Michael (November 9, 2018). "Whitaker's term as U.S. attorney in Iowa draws scrutiny". Washington Post. Retrieved November 13, 2018. ↑ Leip, David (December 14, 2007). "State Sen. McCoy not guilty of extortion". Sioux City Journal. Retrieved November 7, 2018. ↑ Griffin, Drew; Richards, Collette; DiCarlo, Patricia (November 10, 2018). "Whitaker's controversial prosecution of a gay Democrat". CNN. Retrieved November 10, 2018. ↑ "As U.S. attorney, Whitaker imposed longer-than-usual drug sentences". Washington Post. Retrieved November 21, 2018. ↑ "Iowa Southern District U.S. Attorney to Resign". MainJustice.com. November 6, 2009. Archived from the original on October 8, 2011. Retrieved February 6, 2010. ↑ D'Angelo, Bob (November 7, 2018). "Who is Matthew Whitaker, the acting U.S. Attorney General?". The Atlanta Journal-Constitution. Retrieved November 9, 2018. ↑ "Matt Whitaker and Ed Failor to lead new lobbying and consulting practice". Iowa Caucuses. Retrieved December 19, 2018. ↑ Banco, Erin; et al. (November 7, 2018). "Jeff Sessions' Replacement, Matthew Whitaker, Led Secretive Anti-Dem Group". The Daily Beast. Retrieved November 9, 2018. ↑ "GOP's Matt Whitaker says he's running for U.S. Senate". Archived from the original on June 28, 2013. Retrieved May 7, 2013. ↑ Obradovich, Kathie (June 30, 2014). "'Non-politician' Clovis drafted into new race". Des Moines Register. Retrieved November 8, 2018. ↑ Bertrand, Natasha (November 7, 2018). "What Sessions's Resignation Means for Robert Mueller". Retrieved November 7, 2018. ↑ "Top Trump campaign aide Clovis spoke to Mueller team, grand jury". Retrieved November 7, 2018. ↑ Caroline Kelly and Liz Stark. "Former Trump co-chairman on meeting FBI source: Like sitting in 'faculty lounge talking about research'". CNN. Retrieved November 7, 2018. ↑ Samuels, Brett (November 13, 2018). "Whitaker's past business dealings under scrutiny". TheHill. Retrieved November 14, 2018. ↑ "Acting Attorney General Abandoned a Taxpayer-Funded Project in Iowa in 2016". Time. Retrieved November 14, 2018. ↑ "Des Moines City Council Communication - Office of the City Managre - Resolution Approving HOME Agreement, Mortgage, and Related Documents, and Subordination Agreement, with We Can Build It, LLC for the Renovation of 2714 Ingersoll Avenue" (PDF). City of Des Moines. August 22, 2016. Retrieved November 30, 2018. ↑ Moreno, Peter (May 18, 2018). "Fraudulent Marketers Banned from Invention Promotion Business – USA Herald". USA Herald. Retrieved November 7, 2018. ↑ Marketing, World Patent. "Former Republican Candidate for the United States Senate Joins World Patent Marketing Advisory Board". PR Newswire. Retrieved November 7, 2018. 1 2 Shammas, Brittany (August 22, 2017). "A Miami Beach Scam Took Millions of Dollars From Thousands of Inventors, Feds Say". Miami New Times. Retrieved November 7, 2018. ↑ "Whitaker, acting U.S. attorney general, was on board of firm that threatened duped clients with 'Israeli Special Ops'". Haaretz. November 8, 2018. Retrieved November 10, 2018. ↑ Maremont, Mark (November 7, 2018). "Jeff Sessions’ Successor Had Advised Company Accused of Scam". The Wall Street Journal. ↑ "FTC Halts Invention Promotion Scheme Charged With Bilking Millions of Dollars from Consumers". Federal Trade Commission. March 14, 2017. Retrieved November 7, 2018. ↑ Bronstein, Scott. "Whitaker's link to a 'scam' company that was shut down by the government". ABC News. Retrieved November 10, 2018. ↑ Shammas, Brittany (November 7, 2018). "Trump's Acting Attorney General Was Part of Miami-Based Invention Scam Company". Miami New Times. Retrieved November 10, 2018. ↑ "'He was yelling': Whitaker pushed back against early fraud complaints about company he advised". Washington Post. Retrieved November 16, 2018. 1 2 3 Leonnig, Carol D.; Helderman, Rosalind S. (November 9, 2018). "Federal investigators scrutinized Whitaker's role in patent company accused of fraud". The Washington Post. Retrieved November 9, 2018. ↑ Zeitlin, Matthew. "The New Acting Attorney General Was Previously a Dark Money–Funded Clinton Antagonist". Slate. Retrieved November 8, 2018. ↑ Lanard, Noah (November 7, 2018). "Matthew Whitaker, the New Acting Attorney General, Was Obsessed With Clinton's Emails". Mother Jones. Retrieved November 9, 2018. ↑ "Matthew Whitaker". Fox News. November 8, 2018. Retrieved November 8, 2018. ↑ "Conservative group calls for Grayson ethics probe". POLITICO. Retrieved November 8, 2018. ↑ Gold, Matea (February 20, 2015). "Conservative watchdog group accuses Democrats of illegally coordinating through voter data firm". Washington Post. Retrieved November 9, 2018. ↑ Novak, Viveca; Massoglia, Anna (April 15, 2016). "New nonprofit tied to stealthy circle of dark money groups". OpenSecrets News. Center for Responsive Politics. Retrieved November 9, 2018. ↑ Kenneth P. Vogel & Maggie Haberman (November 20, 2018). "Matthew Whitaker Earned $1.2 Million From Group Backed by Undisclosed Donors". New York Times. ↑ "Trump's new acting attorney general was obsessed with Clinton's emails". Mother Jones. Retrieved November 8, 2018. ↑ Croucher, Shane (November 8, 2018). "Here's a list of Democrats acting AG Matt Whitaker wanted to investigate". Newsweek. Retrieved November 13, 2018. ↑ "In home state, new acting AG Whitaker was accused of playing politics with justice". CNN. November 9, 2018. Retrieved November 14, 2018. ↑ Freedlander, David (November 9, 2018). "When Matthew Whitaker Ran 'a Chop Shop of Fake Ethics Complaints'". New York Magazine - Intelligencer. Retrieved November 14, 2018. ↑ Woodruff, Betsy; Tani, Maxwell; Sommer, Will (November 8, 2018). "Matthew Whitaker, Mueller's New Boss, Said There Was 'No Collusion' With Russia". The Daily Beast. Retrieved November 9, 2018. ↑ "Acting Attorney General Matt Whitaker Was a CNN Contributor". The Hollywood Reporter. November 7, 2018. Retrieved November 7, 2018. ↑ Whitaker, Matthew. "Mueller's investigation of Trump is going too far". CNN. Retrieved October 11, 2018. 1 2 3 Reilly, Ryan J. (September 22, 2017). "Jeff Sessions' New Chief of Staff: Mueller's Russia Probe Could Be A 'Witch Hunt'". HuffPost. Retrieved November 7, 2018. ↑ "Matthew Whitaker Takes His Twitter Account Private, After His Tweet About the 'Mueller Lynch Mob' Reveals Conflicts". Fortune. Retrieved November 10, 2018. ↑ "Matt Whitaker Named AG's Chief of Staff". National Association of Former United States Attorneys. October 11, 2017. ↑ Jansen, Bart (November 7, 2018). "Who is Matthew Whitaker? Hawkeye football star and federal prosecutor becomes acting attorney general". USA Today. Retrieved November 9, 2018. ↑ "Trump fires Jeff Sessions, names Matthew Whitaker as interim attorney general". Retrieved November 7, 2018. ↑ "Acting Attorney General Whitaker Announces National Security-Related Criminal Charges Against Chinese Telecommunications Conglomerate Huawei". U.S. Department of Justice. January 28, 2019. ↑ "Acting Attorney General Matthew Whitaker Announces National Security-Related Criminal Charges Against Chinese Telecommunications Conglomerate Huawei". U.S. Department of Justice. January 28, 2019. ↑ "Chinese Telecommunications Device Manufacturer and its U.S. Affiliate Indicted for Theft of Trade Secrets, Wire Fraud, and Obstruction Of Justice". U.S. Department of Justice. January 28, 2019. ↑ "Chinese Telecommunications Conglomerate Huawei and Huawei CFO Wanzhou Meng Charged With Financial Fraud". U.S. Department of Justice. January 28, 2019. ↑ Boyd, Stephen (December 20, 2018). "McConnell and Schumer" (PDF) (Letter). Letter to. The New York Times. Retrieved December 21, 2018. ↑ Lucas, Ryan (December 21, 2018). "Acting Attorney General Whitaker Won't Recuse Himself From Mueller Inquiry". NPR. Retrieved December 21, 2018. ↑ "Trump's interim pick to lead Justice Department faces scrutiny over criticisms of Mueller inquiry". USA Today. November 8, 2018. Retrieved November 10, 2018. ↑ "Why Trump could face legal challenges over Whitaker". Axios. Retrieved November 9, 2018. ↑ Rudalevige, Andrew (November 10, 2018). "No one is surprised that Jeff Sessions is out. But is his replacement's appointment unconstitutional?". The Washington Post. Retrieved November 10, 2018. But Conway’s pedigree is quite different. While he has recently become a public critic of Trump, in the 1990s Conway helped with the Paula Jones case that helped lead to Bill Clinton’s impeachment; he is married to high-ranking Trump staffer Kellyanne Conway; and he was seriously considered for the role of Trump’s solicitor general. ↑ Vladeck, Stephen I. (November 9, 2018). "Whitaker May Be a Bad Choice, but He's a Legal One". The New York Times. Retrieved November 9, 2018. ↑ Yoo, John (November 13, 2018). "Whitaker's Appointment as Acting Attorney General Is Unconstitutional". The Atlantic. Retrieved November 19, 2018. ↑ Bies, John E. Matthew Whitaker's Appointment as Acting Attorney General: Three Lingering Questions, Lawfare, November 8, 2018. ↑ Tucker, Eric (November 14, 2018). "Justice legal opinion backs Whitaker's naming as acting AG". Associated Press. Retrieved November 14, 2018. ↑ Jarrett, Laura (November 14, 2018). "DOJ says Whitaker's appointment as acting attorney general is constitutional". CNN. Retrieved November 14, 2018. ↑ "After outcry over appointment, Trump's top law enforcer treading..." December 16, 2018. Retrieved February 15, 2019 – via www.reuters.com. ↑ Gurman, Sadie. "Maryland Files Challenge to Matthew Whitaker's Installation as Acting Attorney General". Wall Street Journal. Retrieved November 13, 2018. ↑ McFadden, David. "Maryland lawsuit seeks to protect Affordable Care Act from 'sabotage'". baltimoresun.com. Retrieved November 13, 2018. ↑ "The Health 202: Maryland lawsuit aims to uphold ACA's constitutionality". The Washington Post. Retrieved November 30, 2018. ↑ "Press Release - Attorney General Frosh Files Lawsuit to Protect Marylanders from the Trump Administration's Sabotage of the Affordable Care Act" (PDF). Retrieved November 30, 2018. 1 2 "Maryland Says Matthew Whitaker Appointment As Acting Attorney General Is Unlawful". NPR.org. Retrieved November 13, 2018. ↑ "Appointment of acting attorney general challenged in court". AP NEWS. November 13, 2018. Retrieved November 13, 2018. ↑ "Whitaker's Appointment as Acting Attorney General Faces Court Challenge". New York Times. Retrieved November 13, 2018. 1 2 3 Gerstein, Josh (November 15, 2018). "Texas businessman challenges acting AG's legality". Politico. Retrieved November 16, 2018. ↑ "Senate Democrats file lawsuit against Matthew Whitaker's appointment". November 19, 2018. Retrieved February 15, 2019 – via www.theguardian.com. ↑ "Supreme Court asked to rule on Trump's choice of Matthew Whitaker as acting attorney general". Retrieved November 17, 2018. ↑ "Matt Whitaker's appointment as acting attorney general challenged in Supreme Court". Retrieved November 17, 2018. 1 2 3 4 5 Savage, Charlie (November 8, 2018). "Acting Attorney General Matthew G. Whitaker Once Criticized Supreme Court's Power". The New York Times. Retrieved November 9, 2018. ↑ Hall, Jacob. "Iowa U.S. Senate Candidate Profile: Q&A with Matt Whitaker". Retrieved November 9, 2018. ↑ Kranish, Michael; Barnes, Robert (November 9, 2018). "As a Senate candidate, Whitaker said he could not support ‘secular’ judicial nominees and that courts should be 'inferior branch'". The Washington Post. ↑ "Acting Attorney General Matthew Whitaker once said Jews, Muslims and Atheists should not be federal judges". Newsweek. November 9, 2018. Retrieved November 11, 2018. 1 2 Kaczynski, Andrew (November 10, 2018). "Whitaker said he supports state's rights to nullify federal law". CNN. Retrieved November 10, 2018. 1 2 Goldman, Adam; Shear, Michael D.; Smith, Mitch (November 9, 2018). "Matthew Whitaker: An Attack Dog With Ambition Beyond Protecting Trump". The New York Times. Retrieved November 10, 2018. ↑ Woodruff, Betsy; Tani, Maxwell; Sommer, Will (November 8, 2018). "Matthew Whitaker, Mueller's New Boss, Said There Was 'No Collusion' With Russia". Retrieved November 12, 2018 – via www.thedailybeast.com. 1 2 Rieger, JM (November 9, 2018). "Trump's new acting attorney general has long criticized the Russia probe". The Washington Post. Retrieved November 12, 2018. 1 2 3 4 "Trump Installs a Critic of the Mueller Investigation to Oversee It". Retrieved November 12, 2018. ↑ "Acting AG in 2017: 'No collusion' between Russia and Trump campaign". Retrieved November 12, 2018. ↑ Sheth, Sonam (November 13, 2018). "Acting attorney general Matthew Whitaker will consult with DOJ ethics officials about whether he should recuse himself from the Russia probe". Business Insider Australia. Retrieved November 13, 2018. 1 2 Waas, Murray (November 9, 2018). "Exclusive: Trump loyalist Matthew Whitaker was counseling the White House on investigating Clinton". Vox. Retrieved November 9, 2018. ↑ Perez, Evan; et al. (November 9, 2018). "Sessions realized too late that Whitaker was auditioning for his job". CNN. Retrieved November 10, 2018. ↑ Price, Dave (September 9, 2018). "Report: Former Iowa Hawkeye Tight End Might Be President Trump's Next Lawyer". WHO TV. Des Moines. Retrieved September 11, 2018. ↑ Swan, Jonathan (September 9, 2018). "Scoop: Inside Trump's biggest hire". Axios. Retrieved September 11, 2018. 1 2 Benner, Katie; Haberman, Maggie (September 26, 2018). "Matthew Whitaker, a Trump Loyalist, Is Seen as Ascendant Amid Rosenstein Chaos". The New York Times. Retrieved November 9, 2018. ↑ Zapotosky, Matt; Dawsey, Josh (October 11, 2018). "Trump talked with Jeff Sessions's own chief of staff about replacing him as attorney general". The Washington Post. Retrieved October 11, 2018. ↑ Schreiner, Bruce (November 10, 2018). "Thin ice for new acting AG? Trump says 'I don't know' him". Associated Press. Retrieved November 10, 2018. ↑ Sullivan, Eileen; Benner, Katie (November 9, 2018). "Trump on Friday: 'I Don't Know Matt Whitaker.' Trump Last Month: 'I Know Matt Whitaker.'". The New York Times. Retrieved November 10, 2018. ↑ Wagner, John (November 9, 2018). "Trump claims he doesn't know his new acting attorney general. A month ago he said he did". Washington Post. Retrieved November 30, 2018. ↑ "Matthew Whitaker on Principles & Values". www.ontheissues.org. Retrieved November 12, 2018. ↑ "Iowa's U.S. Senate seat: Matt Whitaker, Republican". Des Moines Register. Retrieved November 12, 2018. ↑ "Fired newspaper editor who blogged about gays' 'sinful nature' files lawsuit". LGBTQ Nation. Associated Press. July 24, 2014. Retrieved November 12, 2018. ↑ "Whitaker, Matt". Our Campaigns. Retrieved November 9, 2018. ↑ "State of Iowa Canvass Summary - Election: 2002 General Election (11/5/2002)" (PDF). December 2, 2002. Retrieved November 8, 2018. ↑ "2014 Primary Election Canvass Summary" (PDF). Iowa Secretary of State. Des Moines, Iowa: State of Iowa. Retrieved November 9, 2018. Wikimedia Commons has media related to Matthew Whitaker.